B20 Turkey Kick-off Meeting was held in Four Seasons Hotel in Istanbul attended by hundreds of representatives and businessmen from nearly 40 countries. Deputy Prime Minister Ali Babacan and B20 Turkey Executive Council Chair and TOBB President M. Rifat Hisarcıklıoğlu gave opening remarks during the meeting where B20 Turkey Executive Council Member and ICI Chairman Erdal Bahçıvan were also present. B20 Turkey Kick-off Meeting was hosted by Deputy Prime Minister Ali Babacan and B20 Turkey Executive Council Chair and TOBB President M. Rifat Hisarcıklıoğlu in the presence of a large crowd of national and international representatives. B20 Turkey Executive Council Chair and TOBB President M. Rifat Hisarcıklıoğlu moderated the session entitled "B20 Turkey: Approaches, Priorities and Expectations". 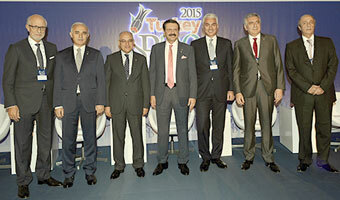 The panel was attended by Tuncay Özilhan on behalf of DEIK (Foreign Economic Relations Board); Nail Olpak, President of MUSIAD; Mehmet Büyükekşi, President of the Turkish Exporters Assembly (TİM); Haluk Dinçer, President of TUSIAD, Erol Kiresepi, Vice President of Turkish Confederation of Employer Associations (TISK) and ICI Chairman Erdal Bahçıvan on behalf of TOBB. B20 Turkey Kick-off Meeting started with the opening speech by M. Rifat Hisarcıklıoğlu during which he referred to intensive efforts of preparation for 2015 since they took over B20 presidency from Australia last month. Hisarcıklıoğlu emphasized the profound significance of increasing cooperation between governments and business worlds in an environment where global economy is in search of a roadmap for solid growth. He stated: "This is precisely why we have to further bolster B20, the business arm of G20" and added it would be possible through working more closely with the G20 and looking for the right way together. He also added: "I believe that Turkey's G20 term presidency will be a milestone in this respect." Hisarcıklıoğlu added that having taken over term presidency from Australia, their goal was to take B20 to the next level: "We are building the 2015 journey of B20 on 3 major principles. Our principle of continuity is based on maintaining the precious work produced during previous term presidencies of B20. We believe that B20 should have a multiannual agenda just as G20. We cannot achieve success by re-structuring B20 each year. We as businessmen know this so well from our business experience. Continuity brings success. We will start by working on the 20 proposals submitted by B20 Australia to G20 leaders. We will ask the questions: How to bring these proposals to life? How to improve these 20 proposals? This year we will also continue task forces and working groups, implemented last year, as our fundamental task forces. We will continue to work on commerce, infrastructure and investments, financing growth, employment and anti-corruption. Each of these groups will be presided over by the leaders of our giant companies. Together with foreign co-presidents, they will carry out activities throughout the year. The trade group will be presided by Güler Sabancı, Chairperson of the Board of Directors of Sabancı Holding, listed as one of the three most powerful women of the world. In this group she will work with Terry McGgraw, Chairman of ICC, the world's largest business organization, and of the Board of Directors of McGraw Hill Financial, parent company of Standard & Poors. The Infrastructure and Investments Group will be presided by Ferit Şahenk, Chairman of the Board of Directors of Doğuş Holding, a rising star with successful investments both on national and international scales. Hüsnü Özyeğin, Chairman of the Board of Directors of FIBA Holding with a background in founding a billion-dollar bank from scratch, will be president of the Financing Growth group. Ali Koç, Koç Holding Board Member, the biggest holding and the biggest employer of Turkey, will be the president of the Employment group. Mr. Ali will be working in this group with Daniel Funes di Rioja, President of IOE, umbrella organization of 150 employers. And our anti-corruption group will be presided by Murat Ülker, Chairman of the Board of Directors of Yıldız Holding, a source of pride for us with their acquisitions of Godiva and United Biscuits. In brief, we will continue to work with all our strength in all five taskforces. Another structure we will build as part of our continuity efforts will be the B20 Leadership mechanism entitled "B20 Advocacy Leadership". We will designate 2 or 3 effective businesspersons, chambers or business organizations from each country. The resulting team of 50 to 60 persons will be highly efficient in lobbying for our proposals at G20 government levels. This group will also serve as a permanent leadership mechanism in establishing continuity within B20. The second principle that will provide basis to our activities is engagement. We believe that B20 should be accessible to anyone who wants to work for the benefit of the business world. Our multinational companies and SMEs, developed countries and developing countries are all valuable to us. We are establishing two new mechanisms in this regard. Firstly, we will be building the SMEs and Entrepreneurship Task Force that will develop proposals for SMEs and entrepreneurs. The president of this group will be Melih Yurter, who has conducted significant research in the expansion of Afyon's SMEs abroad and is a successful entrepreneur himself. This new task force will enable SMEs, providers of two thirds of formal employment within G20 countries, to assert themselves for the first time in the B20 platform. Our second step towards enhancing engagement at B20 will be to organize regional consultation meetings across the world. We have two purposes in this initiative. First of all, we want to engage rising market economies, underrepresented within G20, further in the B20 process. Our second purpose is to take the opinions of non-G20 countries on the B20 agenda. We cannot discriminate between G20 and non-G20 countries here because non-G20 countries are our partners too. We do business and establish partnerships with them. Therefore, we have to give voice to them as well. The third principle that governs our B20 activities will be connectivity. As you all know, G20 countries vary greatly. Some of these are better integrated in the global economy while some others feel disadvantaged. These different positions make it hard to reach a consensus in our decisions. We believe that we can overcome this issue by reinforcing connectivity. We will work this principle as a horizontal area undergirding all of our taskforces. We will thereby discuss how to develop logistic connections, a serious obstacle to expanding business. We will examine problems in business connections to facilitate joining supply chains. We will work on strengthening digital connections so that all countries benefit equally from the Internet economy." Hisarcıklıoğlu stated that the B20 2015 had a busy agenda ahead and added in his remarks: "As leader of the Turkish business world, I would like to call out to the esteemed managers of our companies. Regrettably, we are not sufficiently present in platforms guiding the global economy." Hisarcıklıoğlu pointed out that they desired to change this situation in the interest of the Turkish business world and announced that they will be creating a Business Leaders Forum of 100 members, made up of top managers of Turkish companies. Hisarcıklıoğlu stated that they will be conducting their B20 activities with this team of 100 throughout 2015 and called out to representatives of the business world to join these activities and hence take a step towards becoming global actors. Deputy Prime Minister Ali Babacan took the floor at the opening of the B20 meeting and stated that they submitted two new proposals to the G20. Babacan referred to Turkey's strong emphasis on SMEs adding that they will be addressing many of the problems faced by SMEs during the G20 presidency. He also stated that agreement was reached on creating a "Global SME Platform" on which SME representatives from across the globe will discuss all the problems of SMEs. Babacan also underlined the importance of carrying this initiative beyond 2015. Babacan stated that "Investment" will be one of the major agenda items of Turkey's term presidency and added: "Funds are in search of places for long-term investments." Babacan stated their desire to start a new group during Turkey's term presidency called 'W20' in an effort to address businesswomen and their problems during its meetings. He emphasized that not all 20 countries have been consulted on this initiative and added, "But I believe that this group will start. We also want this initiative to go beyond 2015 and become permanent." Babacan added in his remarks that the upcoming term will not be too bright for developed economies, "Developing countries will achieve bigger growth compared to developed countries. Developing economies will continue to draw attention." Following the opening session of the meeting, Deputy Prime Minister Ali Babacan answered questions during the session moderated by Hisarcıklıoğlu. "B20 Turkey: Approaches, Priorities and Expectations"
The session entitled "B20 Turkey: Approaches, Priorities and Expectations" was presided by B20 Turkey Executive Council Chair and TOBB President Rifat Hisarcıklıoğlu. The panel was attended by Tuncay Özilhan on behalf of DEIK (Foreign Economic Relations Board); Nail Olpak, President of MUSIAD; Mehmet Büyükekşi, President of the Turkish Exporters Assembly (TİM); Haluk Dinçer, President of TUSIAD; Erol Kiresepi, Vice President of Turkish Confederation of Employer Associations (TISK) and ICI Chairman Erdal Bahçıvan on behalf of TOBB. ICI Chairman Erdal Bahçıvan took the floor on behalf of TOBB and emphasized that all the chambers and stock exchanges in Turkey constituted a significant structure. His remarks were as follows: "SMEs are of critical import to the global economy. SMEs make up two thirds of formal economy. A wide range of issues will be addressed during this process. We are creating a mechanism for SMEs this year. We want to contribute to the development of support policies for SMEs. A robust economy is achieved with companies with good communications. It is vital that large, medium and small-sized enterprises meet under the umbrella of B20. Mehmet Büyükekşi, President of the Turkish Exporters Assembly (TİM), underscored the high value they placed on trade liberalization and added, "We have to support free trade and lobbying activities. We have to remove the obstacles to trade." Büyükekşi highlighted the importance of innovation and referred to Turkey as a major role model for developing countries. TÜSİAD President Haluk Dinçer emphasized the degree to which G20 and B20 Term Presidencies offered a key opportunity for Turkey and that as TÜSİAD they will be contributing to the best of their abilities. Dinçer referred to sustainability, employment, anti-corruption, increasing entrepreneurship and innovation as top priorities and laid special emphasis on continuity and engagement. Nail Olpak, MÜSİAD President, underlined the issue of income inequality: "1 percent of the world population today earns 40 percent of income. 50 percent has access to 1 percent of total income. Income distribution is therefore very important. Including SMEs in this process is crucial." Erol Kiresepi, Vice President of Turkish Confederation of Employer Associations (TISK) drew attention to how they have showed tangible support to the G20 process from the very beginning, " Together with other organizations, we as TISK will also do our best to help this year be a success. We are very eager to assume a substantial role in this picture. I would like to thank my foreign friends for promising sustainability." Tuncay Özilhan took the floor on behalf of DEIK and pointed out to the importance of B20 meetings as platforms on which the business world finds a voice. Özilhan emphasized the importance to consider business circles outside the B20 in these processes as well. B20 Turkey Sherpa Sarp Kalkan gave information on the annual calendar during the meeting.